It started out at the pool on a warm summer. My friends and I went into the bathroom to make a ghost appear in the mirror. So three of my friends went into the bathroom and we said "bloody mary" 47 times. Then all of a sudden we hear our friends screaming so loud that the pool can hear it. But when we opened the door and turned on the lights we saw the devils footprints. It was the scariest thing we ever saw in our lives. The owner of the water park came running and said what was the problem? We all said that we made a ghost appear in the mirror and we showed her the footprints. When the pool owner stepped in there the footprints were gone! The pool owner came out and said there's nothing in there then she told us to get away from the bathroom. When the owner was gone we went in the bathroom again to see if the footprints were there. They were not there. At the time the pool closed at 7:00 all of my friends came to my house. We all slept down in the basement. Then we heard something or someone coming down the stairs we all hid in the bathroom with the door shut. They were louder and louder and louder. Then they stopped we went out and then we saw the devils footprints again!!! My friends and I all thought the footprints followed us home!!! 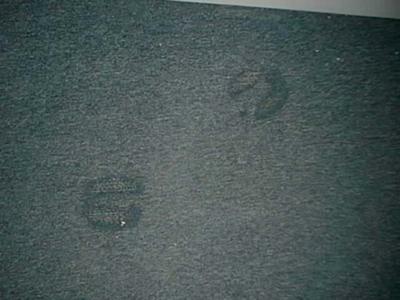 The included picture is what the footprints looked like but it was not at my house though.